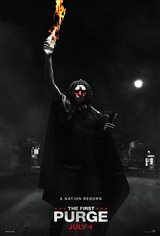 The First Purge is the fourth film in The Purge franchise and will serve as a prequel to the trilogy. It will look back at the first year of the purge when the government sanctioned all crime to be legal for a 12-hour period. In an effort to push the crime rate below one percent for the rest of the year, the New Founding Fathers of America devise a sociological test, with the help of Dr. May Updale (Marisa Tomei). Updale announces to the country that the purge is a psychological device so that Americans can release all of their anger in one night. However, the participation rate is lower than she expected, as good people prepare themselves to protect the innocent. When she realizes that ex-military soldiers are going into suburban neighborhoods to kill citizens, she regrets what she started. The film focuses on one woman (Lex Scott Davis) in particular as she prepares to protect her family against the impending violence, and also participates in a protest against the experiment. Despite her best efforts to stay safe indoors during the purge, she and her family are forced outside into the dangerous streets and must fight to survive the murder spree happening around them.